Looks like getting back to my blogging routine is taking me more time than I wish/expected but last-minute errands keep popping up. Taking a break from time to time and breaking out from our daily routine is good but I like (and need) to have an organized agenda. Being a food blogger is no joke, guys. There are weeks that I get a little stressed out but if I relax for two weeks or so and I don't write new recipes then I get grumpy cause I feel like I'm behind on my blogging tasks. Owell, it's been a long and crazy week, excuse me for being so brief but this tired lady needs some rest and a well deserved couch+tv+chai latte time. 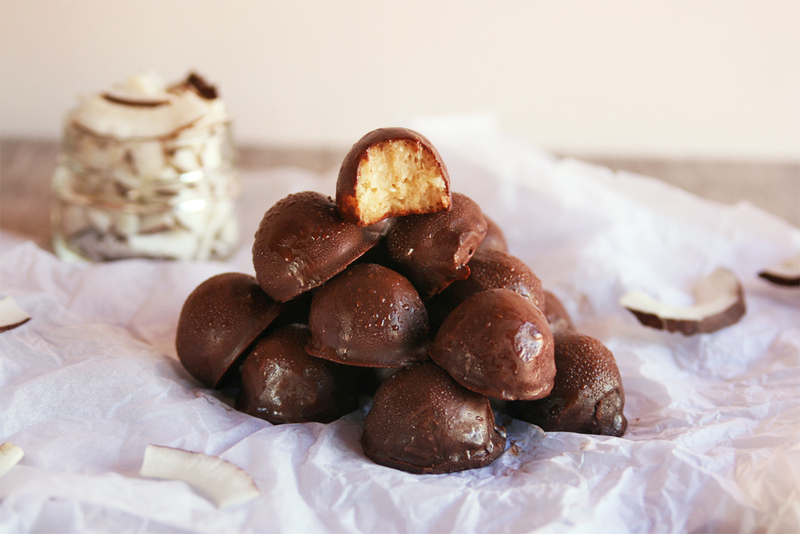 But before I go let me introduce you to my coconut bon bons! These cuties are so delicious, like really really delicious and you can't have just one, you know what I mean? 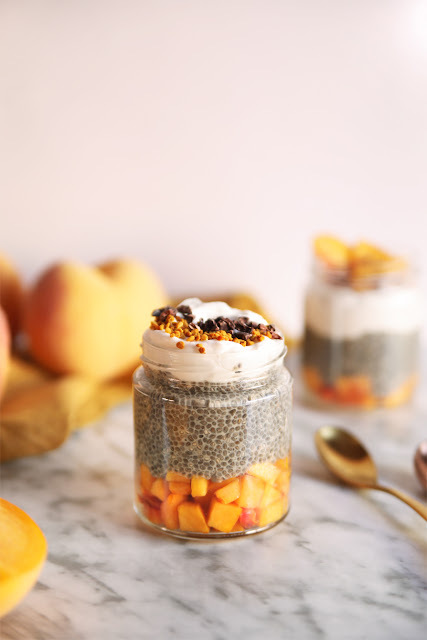 Luckily they make a healthy and guilt-free treat, perfect to satisfy your sweet tooth or to serve as a light dessert after a big feast. Wish I had one of them right now, but they were gone in the blink of an eye! Hope you are all having an awesome week! PS: as you can see it was too darn hot and humid the day I took the pictures, they look a bit 'sweaty', hehe. So if it's hot in your place, I highly recommend you to store them in the freezer. 1 3/4 cups raw shredded coconut. 1/4 cup natural almond butter. 2 to 3 tablespoons coconut syrup. 1/4 cup melted cacao butter (or coconut oil). 1 tablespoon pure maple syrup. Place all the ingredients for the filling inside your food processor and process until a thick mixture forms. It should be thick enough to form into a soft ball. 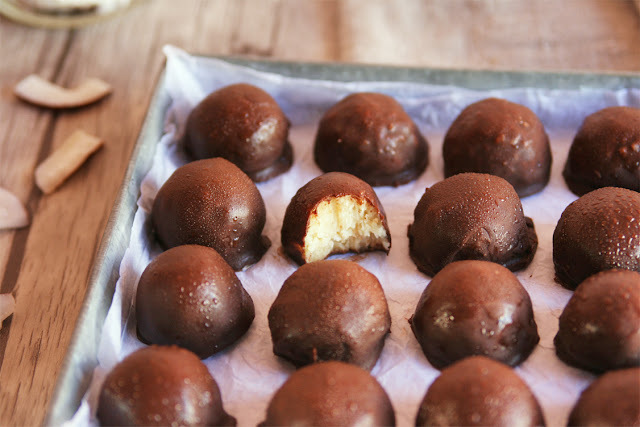 Scoop mixture using a one-tablespoon measuring spoon and roll into balls with your hands, transfer to a baking sheet and let them set in the freezer for 15 minutes approximately. Meanwhile prepare the chocolate coating by stirring the cacao butter, cacao powder and maple syrup in a small saucepan over low heat. Once the mixture is smooth immediately remove from the heat (it shouldn't boil). Set aside to cool. 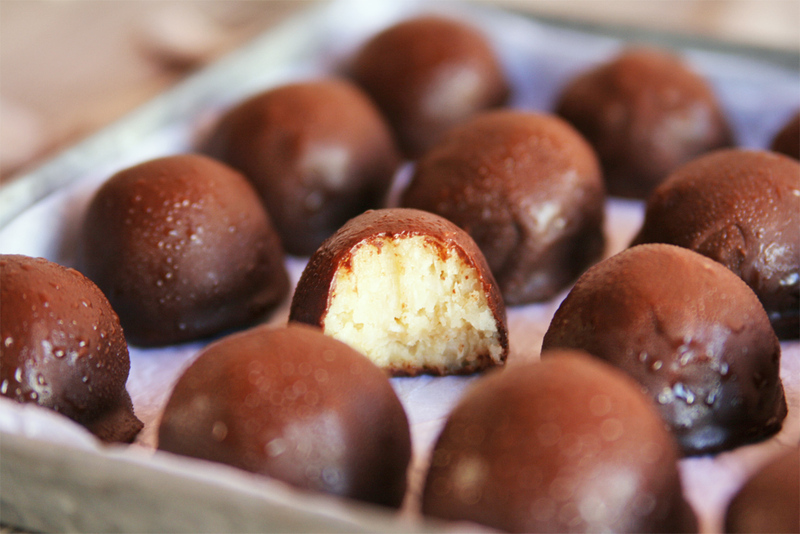 Once the coconut balls are firm, dip each one in the chocolate coating using a toothpick. Transfer to the baking sheet again and freeze again until set. 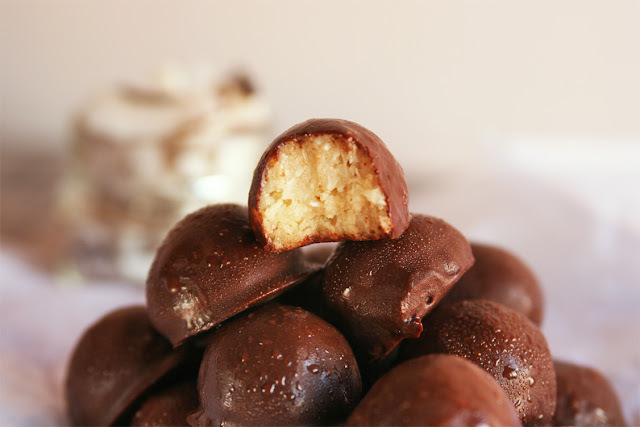 Repeat the coating process to make sure the bon bons are well covered in chocolate. Place in an airtight container and store in the freezer. Definitely so important to have a break every now and then. These coconut bon bons look so good even if they are a little sweaty. I bet they taste like bounty bars but healthier. Thanks a lot Rebecca! I will try a variation of this recipe when the temperature drops...and hopefully they won't look sweaty anymore, hehe. 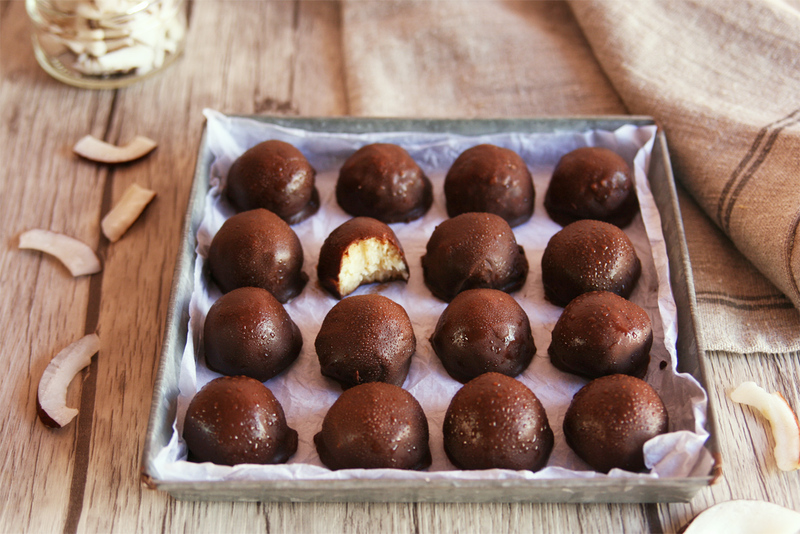 Well now you know you will have to make these bon bons to your boyfriend this weekend.